With only one victory in the last 5 game-weeks, Las Palmas good season start and the lead in the competition now seem like a distant mirage. Last week they could only avoid being defeated in the last minute. And against the team that is in the last place. This weekend they welcome Espanyol in their stadium. Espanyol has been letting their fans down and is fighting to stay away from the last places in the competition. The return of Viera (Las Palmas) and Piatti (Espanyol) to their team’s midfield, after having recovered from injury, is highly expected. Being two teams desperately seeking a win, while also being two of the worst defenses in the championship, we expect a game with many goals. Las Palmas: El Zhar CC-30 pts, Tana CC-27 pts, Roque CC-24 pts. Espanyol: G. Moreno DL-34 pts, Piatti CC-28 pts, Leo Baptistão DL-24 pts. Sampaoli’s team has known how to take advantage from the big team’s lost points to keep themselves in the top spots of La Liga. This week they go to Municipal de Butarque to face a Leganés that hasn’t tasted the flavor of a home win yet. Like Sevilla hasn’t tasted the flavor of a win out of Sanchez Pizjuan. Ending this psychological barrier is the goal for both teams. Leganés : Victor Diaz DF-36 pts, Diego Rico DF-35 pts, Gabriel CC-30pts. Sevilla : Pablo Saraiba CC-28 pts, Vietto DL-26pts, Franco Vázquez CC-25 pts. Barcelona is still with the heavy loss in Galiza on their mind and this week they are back facing another galician team. A team that, in the last two seasons, was able to tie at Camp Nou. We suspect that Luis Enrique’s rotations continue. Even after the last two bad experiences. Especially because the game against his “friend” Pep, for the leadership in their Champions group, is getting very near. The game with Deportivo should mark Messi’s comeback after injury. Even if it’s just a few minutes. Deportivo comes from a victory that has made the team more peaceful. But their record playing outside their home stadium is quite embarrassing. They haven’t scored one goal playing away. However, the results of their last two games in Camp Nou are the right kind of motivation to break with that record. Barcelona : Messi DL-36 pts, Arda Turan CC-35 pts, Piqué DF-35 pts. Deportivo : Lux PT-27 pts, Mosquera CC-26pts, Celso Borges CC-25 pts. Atlético is the new La Liga leader and should maintain themselves as such by the end of the game-week. They are getting the visit of the last team in the table. The one that has only 2 points and is the worst defense in the competition. After a trembling start, Atlético seems to have found their game style. We believe that Simeone won’t change the squad much, even facing the last team of the table. Granada’s new coach couldn’t ask for a worst opponent for his premiere. No one will ask him to win, for sure. What will be asked is a more organized team. With more composed players. That show an ability to get to the end of the season without losing their minds. Atl. Madrid : Griezmann DL-41 pts, Filipe Luis DF-41 pts, Oblak PT-39 pts. After 3 ties in a row and getting caught by the other team from Madrid in the top of the table, it is now the moment to react and end this negative cycle. We can already feel it coming by looking at the 5 goals in 2 games that Ronaldo has scored for Portugal. But not everything were good news in this international break. Sergio Ramos injury, along with Casemiro and Modric, create yet another headache for Zidane. Bétis has shown very little this season. To get away from the bottom half of the table they will have to bet on Adán’s defensive skills and in Ruben Castro offensive ones. Bétis : Adán PT-36 pts, Ruben Castro DL-36 pts, Piccini DF-27 pts. Real Madrid : Bale CC-35 pts, Kroos CC-33 pts, Sergio Ramos DF-30 pts. The basque team, in spite of doing a quiet championship, will have to put an end to the late goals they have been suffering. They have been loosing points that will certainly make a difference in the future. Málaga, on the other hand, was able to leave the bottom of the table with the win in their last game. Being very cold and analytical teams in the way they play, we shouldn’t be surprised if the game has very few goal opportunities and it might even end in a goalless tie. Alavés : Pacheco PT-29 pts, Llorente CC-28 pts, Kiko Femenía DF 26 pts. Málaga : Camacho CC-24 pts, Juanpi CC-24 pts, Sandro DL-23 pts. Historical derby in the Basque Country, with the tie being the most common result in recent history (4 in the last 5 games between these two teams). Athletic hasn’t won a derby since 2011/2012 and this week seems like an excellent opportunity to put an end to this desert crossing. After the defeat in the last game-week, Los Leones were doing a sequence of 4 victories in a row and show superior quality in their game when compared with their opponent. Real Sociedad, having a very irregular start this season, will look at the history of the last games against Athletic for motivation. And to having 2 game-weeks in a row without loosing. Athletic : Aduriz DL-31 pts, Beñat CC-28 pts, San José DF-26 pts. Real Sociedad : Oyarzabal CC-29 pts, Zurutuza CC-28 pts, Willian José DL-28 pts. Sporting Gijón is falling and has already 4 consecutive losses after a promising season start. The situation shouldn’t improve very soon because this game-week they will face Valencia that was also going through a bad moment but with the difference that they have players to turn it around. Valencia’s coach Prandelli will make his debut in La Liga after a bad experience in Galatasaray. Being Prandelli an italian coach we are quite curious to know if he will play in the 3-5-2 that they seem to love so much or if he will keep the 4-2-3-1. Sporting Gijón : Cop DL-30 pts, Sergio Alvarez CC-28 pts, Victor Rodriguez CC-26 pts. Valencia : Parejo CC-30 pts, Diego Alves PT-26 pts, Nani CC-23 pts. We anticipate an excellent game between Villareal, that hasn’t lost this season yet, and Celta de Vigo, that comes from an humongous win over Barcelona. That’s three wins in a row for Celta. 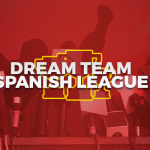 Fran Escriba’s team comes from a tie in the last game-week but still aims to reach the top spots in the competition. For that they rely on Samu Castillejo, Sansone or Soriano having an inspired game. Celta de Vigo bets its hopes on Iago Aspas and Pione Sisto to add 3 points in El Madrigal. They both have 2 goals and 1 assist in the last 3 matches. Villareal : Sansone CC-42 pts, Castillejo CC-36 pts, Asenjo PT-31 pts. Celta de Vigo : Pione Siste CC-31 pts, Sergio Álvarez PT-26 pts, Iago Aspas DL-25 pts. Eibar has been one of the good surprises in this beginning of the season. Getting one of the worst teams in La Liga will help them reach the European competitions access spots by the end of the game-week. In it’s turn, Osasuna comes to this game with a disappointing tie in the last game’s last minutes. Speaking of last, if Osasuna has another defeat we risk to say that this will probably be Martin’s last game as a soccer coach. Eibar : Pedro León CC-28 pts, Luna DF-26 pts, Cappa DF-24 pts. Osasuna : Sergio León DL-20 pts, Roberto Torres CC-19 pts, David Garcia DF-18 pts.